On ocean cruises, passengers sometimes spend big at the onboard art auctions. Back on land though, some have found their purchases to be worth a fraction of what they paid. Jason Hall was holidaying on P&O's ship the Pacific Dawn in January when a hand-embellished lithograph by the American Alexandra Nechita caught his eye. He said a representative from the onboard art sales company British Australian Art told him the recommended retail price was $50,000. 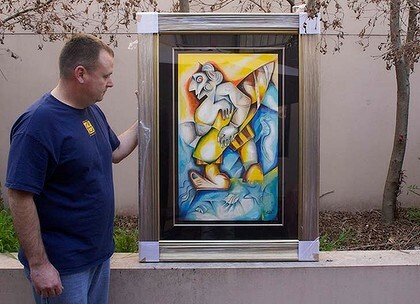 It was beyond his budget - until the auctioneer announced he could sell it for as little as $12,500. He spent more than $20,000 on prints, including $14,465 on Nechita's Riding The Waves. The money came from a compensation cheque he received after being injured in an accident. In Sydney, he approached the art consultant David Hulme for a valuation and was told Nechita had almost no profile among art experts. Records on the website artprice.com showed her prints at recent auctions had sold for far lower prices. The most expensive lithograph in the site's records sold for $US1500 ($1473). Mr Hulme has fielded inquiries from disgruntled cruise passengers before and believes onboard auctions take advantage of inexperienced buyers. ''They have a captive audience with no opportunity to get independent advice,'' he said. For P&O, British Australian Art's presence on the ship is a revenue source, though its financial arrangements with the art company are commercial in confidence. A spokesman said P&O would ensure a full investigation of any complaints. British Australian Art, not registered as a company in Australia, is owned by a Florida company, International Art Galleries LLC. The registered manager, Ira Shore, did not respond to the Fairfax Media's phone calls. A staff member referred the Fairfax Media to the company's Melbourne lawyer, David Boyall of Mason Sier Turnbull. In a statement, Mr Boyall said company policy prohibited auctioneers from making reference to artworks as investments. Predictions a work would appreciate in value were forbidden, as were comparisons between the sales price, suggested retail value or perceived value. ''BAA will thoroughly investigate any allegations that its staff have breached its written guidelines for the benefit of purchasers,'' Mr Boyall said. The company said there have been ''very few'' cases of buyers asking for refunds because of dissatisfaction with the value of a work. Of the two such cases in the past three months, it said one was refunded promptly and the other would be refunded once the necessary documentation was complete. US court documents show Ira Shore has been involved in arts disputes before. In California and Michigan district courts between 2003 and 2004, he and a business associate, Albert Scaglione, defended allegations they failed to pay in full for $7.4 million worth of prints by the artist Thomas Kinkade and violated copyright. The case was later dismissed. In the US, Mr Scaglione's company Park West Gallery has been involved in class-action lawsuits brought by cruise ship passengers who claim the company misrepresented the value of paintings they bought at sea. The proceedings were dismissed at the request of both parties, which suggests a settlement was reached out of court. Sales on the high seas present jurisdictional difficulties for courts. Andy Schmulow, a lecturer at Victoria University's Faculty of Business and Law, said such sales were unlikely to be covered by the jurisdiction of Australian courts. Mr Hall is yet to hang his prints and NSW Fair Trading is assisting with his complaint. The agency plans to raise the issue with other consumer protection regulators, including the ACCC. Mr Hall said he received a call from P&O after the Fairfax Media started making inquiries, offering a refund or an investigation. He refused as Fair Trading was involved. ''I planned to keep that painting and give it to my daughter when she got older,'' he said. By Louise Schwartzkoff for the Sydney Morning Herald.